Les Portes du Soleil is a major skisports destination in the northern French Alps (Chablais Alps) encompassing thirteen resorts between Mont Blanc in France and Lake Geneva in Switzerland. With more than 650 km of marked pistes and about 200 lifts in total, spread over 14 valleys and about 400 square miles (1036 square km) Portes du Soleil ranks among the two largest ski areas in the world (the other being Les Trois Vallees). Almost all of the pistes are connected by lifts - only a few marginal towns can only be reached by the free bus services in the area. There are twelve resorts in the Portes du Soleil area, of which seven are French and five are Swiss. 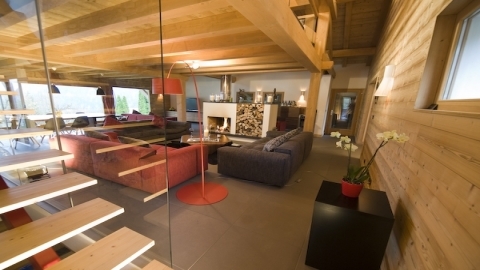 Discover our collection of luxury ski chalets in Chatel. Most of the resorts have grown around traditional valley villages - only Avoriaz and the very small Les Crosets and Torgon were purposely built during the mid-sixties. Morzine and Chatel are the largest of the traditional towns in the area. As a whole the skiing is relatively low in altitude compared to most French destinations. The highest skiing is just below 2.500 metres (7.500 feet) and the lowest app. 900 metres (2.700 feet). However, the area is heavily influenced by the microclimate between Lake Geneva and Mont Blanc, which generates very substantial snowfall between November and April making it possible to keep the area open to skiing typically from early December until mid to late April. Some of the lower stations close around April 1 or earlier depending on snow conditions though. The resort of Chatel lies at 1200 meter and the highest point of skiing is about 2.200 metres, but many of the lower slopes are north facing and do retain the snow throughout the season. A charming, old-fashioned farming village turned ski-resort. The skiing is extensive and varied, with easy access to Avoriaz if you've got a thing about concrete. There are plenty of great restaurants and bars.